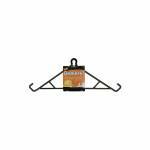 3/8" formed hanger is welded and gusseted for added strength. Powder coated finish. .. 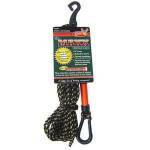 The MAXX Hoisting Rope has a highly-reflective sleeve making it easier to locate in the dark. The plastic sleeve covers and protects the clasp. The carabiner-style hook is dipped in PVC to prevent damaging to your bow. 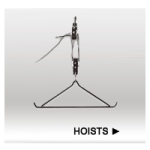 The metal carabiner hook lifts heavier items up in the treestand. Rope is 25' long. ..